Coptic > Coptology > Should faith run against reason? There can be no two opinions about it: we live in an era where reason and critical thinking reign supreme. But can critical thinking be too much of a good thing, especially given that it is the only tool to sort out the overwhelming amount of diverse, even contradictory, information and opinions we are continually bombarded with? Some fear that, ‘yes’, critical reasoning may be used to undermine something as precious as religious faith. Not so, the Church says; it would be a sorry state of affairs if one had to choose between faith and intellect, to be either a free thinker or a believer. Convinced that faith must go hand in hand with reason, the Coptic Orthodox Church launched its Coptic Apologetics Service under the theme “Servant for all”, indicating that one who serves in the Church should serve or minister to all, inside and outside the Church. ‘Apologetics’ in Arabic translates into ‘defence’; ‘service’ is meant to denote ‘ministry’. The programme is affiliated to the Bishopric of Youth and aims at mentoring a team of Church ministers to lead young people along an intellectual path that eventually reconciles their reason with their faith. It runs under the auspices of Pope Tawadros II; Anba Moussa, Bishop of Youth; and Anba Raphail, Bishop-General of Downtown Cairo and Secretary of the Holy Synod. All three share a reputation for being exceptionally well-informed, widely read, and exercising reason in a debate. The Apologetics Service programme comprises six courses that centre on the topics: what is apologetics; the apologetics minister in the history of the Church; Christ as an apologetics servant; the theory of evolution; science and faith; and radiocarbon dating. The programme teaches technical skills such as display and presentation as well as research methods. Father Matta Badie who is in charge of the Coptic Apologetics Service gives a briefing on the service. He says it was founded 12 years ago by Father Daoud Lamei of St Mark’s church on Cleopatra Street in the eastern Cairo suburb of Heliopolis, in response to what Fr Daoud observed to be the sort of questions young people ask about the existence of God, Christ, and atheism. Fr Matta says that Fr Daoud launched the service with the help of the dedicated young Christians Wassim Badie, Wafi Fouad and Karim Wagdy, who translated books on atheism from other languages into Arabic. Dr Badie was later ordained Father Matta Badie. The service printed several publications on atheism and related issues, such as good and evil, whether or not man possessed free will, how much in charge of his own destiny he is, and the theory of evolution. The term ‘Apologetics’ was new at the time, Fr Matta says. Yet Anba Moussa welcomed the idea and soon officially adopted this service within the Bishopric of Youth’s various activities. In 2008, the service was baptised the Service of Coptic Apologetics. Fr Matta says the raison d’être of the service is to arm youth against modern atheistic trends and attempts to cast doubts on their Christian faith through plain reason. He explains that modern science and technology were often employed to deny faith, and that young people may not have sufficient Christian knowledge to maintain their faith before such ‘attacks’. The world of today, he says, deals only in evidence, proof, reason and logic, so our youth should be open to the world around them, and well-equipped to counter notions that not only criticise Christian or Orthodox faith and dogma, but also question the existence of God altogether. Coptic Apologetics also works to enhance the awareness of young people and train them to choose good rather than evil in their daily lives, thus striving to entrench Christian faith as a living reality. It focuses on expanding young people’s information base in order to enable them early on to identify and assimilate modern notions that have the potential to shatter their faith, without falling prey to them. The Service also offers awareness programmes to Christian families, priests and Church ministers. It attempts to equip them with sufficient information to reply in a simple, convincing manner to queries of children and teenagers, and to offer substantiated, logical answers backed by theologically and historically proved evidence on the Christian faith. Courses and workshops offered by the Coptic Apologetics Service tackle a number of issues including reconciliation of scientific theories such as the Big Bang and Evolution with the idea of the existence of God; it uses history, archaeology and manuscripts as evidence to support the theory of God’s existence. In addition, Coptic Apologetics discusses and answers common queries and suspicions that relate to Christian faith. In 2016 the Service organised a seminar in cooperation with the prominent American apologetics minister George Bassilios on ‘God and the law of natural ethics’. Rev. Bassilios was groomed under world masters of Christian Apologetics such as Ravi Zacharias, Norman Geisler, Lee Strobel and William Lane Craig. He presents a weekly show on the youth-oriented TV channel CYC (Christian Youth Channel), in which he discusses various apologetics-related topics. In February 2016 a three-day forum for youth was held by the Service under the theme ‘Yes, we believe’, which tackled questions along the line of: Does God really exist? Is Christianity the sole religion? Why is Christ God? What did Christ offer humanity that others did not? Are the Crucifixion and Resurrection mere legends? What are the schools of thought of atheism? Some 400 participants attended the forum. 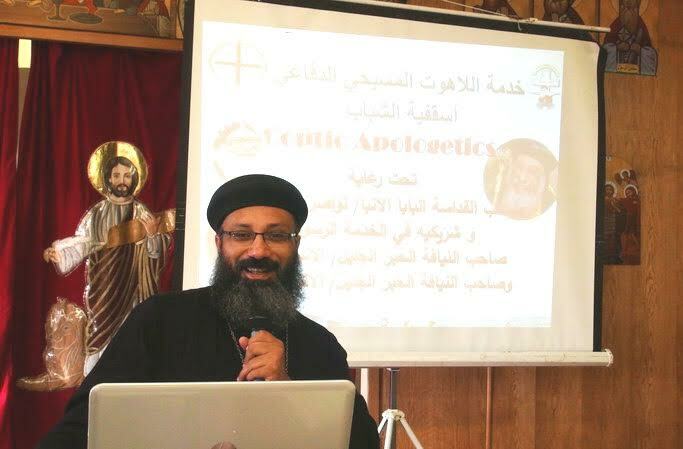 The Coptic Apologetics Service participated in forums organised by the Youth Bishopric. One of them, in which Anba Raphail participated, focused on God in the Old Testament. It tackled the frequently-asked questions of: Is God vengeful? Is He a god that promotes warring and killing, a god that accepts human offerings, or a god that punishes for no obvious reason? In May 2016, in cooperation with the Coptic Orthodox Cultural Centre, the Coptic Apologetics Service organised a seminar under the title, “He already knew them and already chose them”. Anba Moussa handed out appreciation certificates to some 100 Church volunteer workers who had successfully completed courses with Coptic Apologetics. A summer camp in Abu-Talaat on Egypt’s North Coast attracted large participation. Under the title “Through faith, we understand”, it discussed the alleged misquotation of the Bible, as well as other allegations that Islamists use to cast doubts on the credibility and authenticity of the Bible. Fr Matta says that numerous churches and parishes in Egypt have benefited from the courses offered by the Coptic Apologetics Service, among them the Theological Studies Institute of Tema in Upper Egypt, Downtown Cairo churches, and churches in Luxor, Alexandria and Suez. The upcoming project by the Service is to publish books on the issues it tackles. This includes core questions of faith, reason, and the existence of God; as well as other issues which constitute a challenge to the concept of a good God. The all-too-common reasoning that ‘if God does exist and He is good and almighty, how can He allow such intolerable pain and evil in the world?’ should find answers in an upcoming book on the issue of pain.